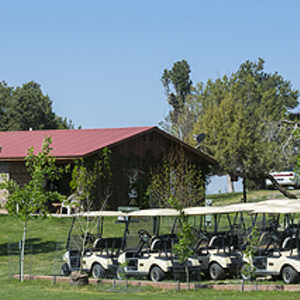 The 9-hole Hunter's Run Golf Course in Ignacio, CO is a public golf course that opened in 1995. A gem of a course! Kudos to whom ever designed the course, starts easy then becomes challenging. Bring a nice cool beverage and plenty of balls, there are hidden water hazards and natural areas that prove difficult to locate your ball. The raised greens will challenge your short game. Carts are available but I recommend walking the course, you will find your self walking in Juniper and Pinion wooded areas. We played with irons thinking the course was short, that was a workout. Still we had an excellent time. Would I play here again? Definitely. So much value here...a fun course in a very relaxing atmosphere with easy access...what else would you need??? The best golf course that I have ever had the experience to play. It's like taking a walk in the Pinon/Juniper woodland, yet it has well-kept fairways and greens that are watered and cut very nicely. Many water hazards makes it more fun - bring lots of balls. There is no hurry here as it's usually not too crowded. Golf snobs won't like it but that's the beauty of this gem. Its quite simple.... if you are a golf snob and are expecting a "traditional" country club type atmosphere this place will disappoint you greatly. It is a legitimate 9-hole course with fairways, greens and bunkers, but it is built on private property by an individual. It is not designed and painstakingly maintained by an association or board of members and lacks some amenities normally associated with a nice public or club course. It is located in a beautiful area and can be enjoyed by amateurs and more serious players so long as expectations are reasonable. Hard to complain about the lack of crowds, price, and course layout. Crappy course and poor management! Way too high for what you get. Don't waste your time! VERY PLEASANT ROUND OF GOLF. This place is ATROCIOUS! It is built on the owner's property. In fact, the owner's mobile home is located at the end of 9 and has been beat to hell by errant golf shots. There is hardly and grass to speak of. The majority of 'grass' is on the greens and it if grass could moan and scream in agony, all the greens here would be doing just that. This is NOT A GOLF COURSE. It is a hobby put together on someone's property. Hunter's Run is a beautiful course with spectacular views. When you play it, bring plenty of balls because it has narrow fairways, plenty of water, and can be very challenging. Very affordable course with friendly staff, cheap carts, and great views. Affordable and awesome!